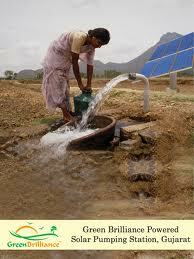 India to Save Water By Going Solar! India has once again shown tremendous confidence in the clean energy by enhancing its 2022 renewable energy target. The country now seeks to achieve 227 GW worth of RE installations by 2022. This humongous target will not only improve India’s green credentials and reduce pollution but will also help conserve water. The problem of water scarcity has already started to surface in India. The popular hill station of Shimla is facing severe water glut, so much so that the tourism and education sectors are adversely hit. India’s 2022 RE target could help reduce water consumption by 25%, estimates Senior Manager, Water Risks & Data Analytics, Global Water Program at World Resources Institute. Did you know India’s thermal power plants use fresh water for cooling? If these thermal power plants are replaced by solar and wind plants, the country could save hugely on water. Wind Power plants require no water for their functioning, while solar PV consumes very little water. The Ministry has taken up this matter seriously and has commanded its various departments to start monitoring and disclosing water withdrawal and discharge data, which will help make better decisions. Studies have further projected that the gap between demand and supply of fresh water is set to widen in India. There have been instances in the past where water scarcity has led to shutting down of power plants, because of their huge dependence on fresh water. This has led to the deprivation of supply of water to nearby towns and villages too. Given the pace at which water scarcity problem in India is growing, it might become a dead end for the thermal power plants. If you look from this angle, it makes even more sense to switch to renewable energy sources of power now more than later. About 14 out of India’s 20 largest thermal power companies experienced shutdowns due to water shortages, between 2013 and 2016. This issue might intensify as India’s power demand is poised to increase in future. India is still taking baby steps in the path of renewable energy and it is almost impossible for the country to 100% switch to solar and wind power resources. The country will still have a large number of operational thermal power plants to power the country’s needs. Improving the efficiency of these plants as well as using advanced cooling technologies could still help conserve a large amount of water, which could have instead used to quench the thirst of millions. Freshwater is the right of every citizen of India. In fact, many organizations like Swajal are working hard to make fresh water available to teh many who are deprived of it. The initiative is also using solar-powered water ATMs to achieve its noble target. India is a growing nation with a huge demand for power, food, and water. The demand for water is likely to almost double to up to 1,500 billion cubic meters in 2030, from 740 billion cubic meters today. The country needs to reduce its dependency on dirty coal which is eating up all the resources and in turn polluting the nation. With more than 400 thermal power plants operating in the country, the government needs to take necessary steps now, before it is too late. It is a great effort on the part of the government to at least identify the issue and with a strong “clean” and focused government at the center, chances are we might be granted some respite on this front.